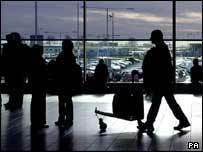 BBC NEWS | UK | England | Soaring future for cheap flights? Soaring future for cheap flights? If you want to know how the low-cost airlines have revolutionised the world of travel you need to go to Stansted airport. Ninety per cent of flights from here are with low-cost carriers - 23 million people passed through here last year. From here it's possible to fly to any part of Europe for as little as £20 and if Ryanair get their way, in the not too distant future it may be possible to fly to the United States for just a few pounds more. "I come from Ireland but live in Cambridge," said one woman. "When I first came here I could hardly ever get home, now it's really cheap and convenient." "Why should air travel be the preserve of the rich," said another passenger. "Thanks to the low-cost airlines we can all have a life". A father with his three young children tells me there's no way he could afford a family holiday to Spain if he had to pay the full fares once demanded by the main carriers. Also checking in, a couple going to their second home in the south of France for the weekend and a stag party bound for Tallinn, now the groom-to-be party capital of Europe thanks to low-cost travel. 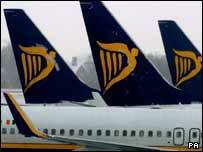 Last week, Ryanair - Stansted's main low-cost airline - announced a 22% increase in passenger numbers to 42.5 million. Easyjet recently announced it is now carrying 16.5 million passengers a year - up 11%. It is partly due to the growth in low-cost air travel, not just here but all around the world that carbon emissions from aircraft have risen by 111% in the past 15 years. "There are major consequences for the ever-increasing use of low-cost airlines" said James Abbot, from the Green Party in Essex. "These include expanding airports, less countryside, more road traffic and of course it is adding to climate change"
The Bishop of London has reportedly said flying was a sin. His colleague, the Right Reverend Tony Footit, former Bishop of Lynn and now environmental advisor to the Diocese of Norwich, has said we all need to think much more carefully about travel. "I think it is immoral to fly within the United Kingdom or Western Europe when it perfectly possible to travel by train but it seems perfectly reasonable to fly to the United States or far east but we ought to really ration it and ask if the trip is really necessary," he said. Although aircraft emissions are rising it is worth keeping this debate in perspective. According to Defra, aircraft emissions accounted for only 6.3% of all carbon emissions in Britain last year. "Most people think airlines are all the same - they really are not" said Andy Harrison, chief executive of Easyjet. "People are going to fly, therefore the most important thing to do is to fly in the most efficient way and when it comes to short haul flying there is no more efficient way than us". He said the main low-cost firms use modern, quieter aircraft, which emit far fewer emissions and are always very close to full. "Last year we emitted 95.7 grams of carbon dioxide per passenger kilometre - that is less than the Toyota Prius," he said. Even if low cost air travel continues unchecked, aircraft will still only account for a very small percentage of carbon emissions. But critics said it is an unnecessary increase at a time when we should be doing everything possible to stave off climate change. And they argue that if we care about climate change we have a moral duty to think very carefully about everything we do - and that includes flying.